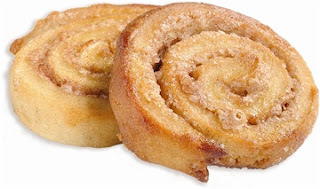 Katz Gluten Free, known for its delicious Gluten Free Breads and Baked Goods, has just came out with 2 new yummy treats! They have added a vanilla flavor to their unique Rugelach. 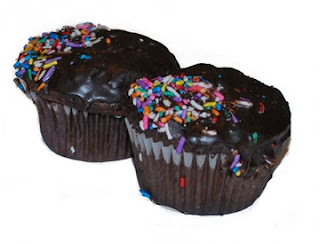 They are also introducing Frosted Chocolate Cupcakes, sure to delight everyone! We love Katz. Fresh baked goodness - you can't even tell it's Gluten- Free. Yumm! Juju's favorite is the Cinnamon Rugelech. When we get Katz, it's all for Ju since he's completely gluten free, but he likes to share and always insists that I have a piece of whatever he's having. I like everything I've tried. It's all really good and tastes homemade. We recently tried the new products - Vanilla Rugelech & Chocolate Frosted Cupcakes with Colored Sprinkles. As you can expect from Katz, everything was delicious. The Vanilla Rugelech are simple with a nice vanilla flavor and work well with breakfast or as a dessert. While Juju still likes the cinnamon better, I think the vanilla flavor was a smart choice in new flavor, as it is simple and goes well with everything. Now the cupcakes got him all excited! I think anything with sprinkles is exciting around here. We had tried the unfrosted chocolate cupcakes and were pleased. The cake closely resembles wheat flour cake and is more light & airy than most GF cake. The new frosted variety is the same cake with a ganache type frosting. Yumm! These treats were great to have around for the holiday season. While I baked plenty of GF goodies, having these premade & ready was great for gatherings where I knew there would be things to eat. I could just take them from the freezer and know that Julien could snack like everyone else - made it easy. Along with rugelech & cakes, you can find rolls & breads, cookies & muffins, and pizza crusts. *Follow me @jamaise at Twitter & Tweet this : RT @jamaise #GIVEAWAY #WIN - a Katz Gluten Free Bakery prize pack & enter the Grand Prize http://bit.ly/ejIGKj Ends 1/6 SO YUMMY tweet each day for one entry each ! I entered their winter giveaway. I am a gfc follower. I entered their Winter giveaway. I entered Katz's giveaway and I am one of your GFC followers. Following Katz on twitter @rusthawk. following this blog on gfc as jhb, and entered their great giveaway...hope I win this fantastic prize. #1 I Like/Fan Katz Gluten Free at Facebook. #2 I Like/Fan Katz Gluten Free at Facebook. I follow your blog and entered the winter giveaway. Thanks. I entered at Katz and I follow Wishing Penny via Google. +3 I follow via Google. I have entered their Winter Giveaway. became a friend and went to Katz to enter the giveaway. I follow you via GFC: allibrary and I entered the Winter Giveaway.